Actual size. Approximately 23 pieces. Our Master Confectioners use only the finest quality ingredients to create CASHEW ROCA� Buttercrunch. We add tropical cashew nuts and pure vanilla to fresh local butter and our Signature Blend of cocoa beans. Each irresistible bite delivers a rich buttery taste sensation. 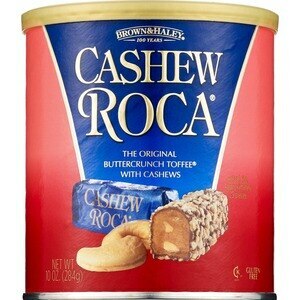 Enjoy CASHEW ROCA� Buttercrunch - the special treat that will delight you and those you care about. MANUFACTURED ON SHARED EQUIPMENT THAT PROCESSES PEANUTS, TREE NUTS, MILK, EGGS, AND SOY. � ALMOND ROCA AND ROCA ARE REGISTERED TRADEMARKS OF THE MANUFACTURER, BROWN & HALEY, 110E. 26TH ST., TACOMA, WA 98421, U.S.A.